Ms. Taylor is the supervisor to Online Clinical Mental Health Counseling Program student Lora Pilcher, who celebrated her first year’s anniversary of volunteering at the Center in November. 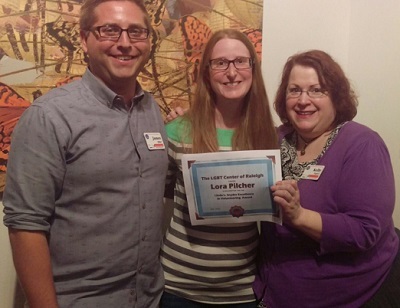 Lora has several reasons for volunteering at the Center, but a primary one was to help LGBTQ teens. Lora wears several hats in her capacity as a volunteer, including as administrative assistant, housekeeper, events planner and tour guide, among many others. 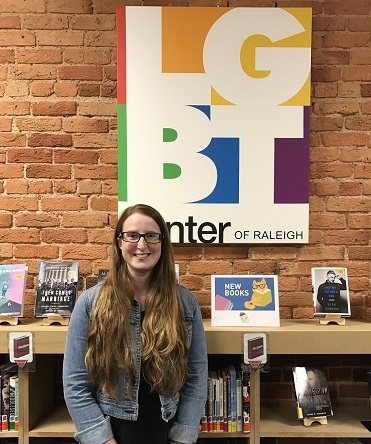 All of her efforts are needed at the Center, which has as part of its mission the goal to identify needs and advocate for resources benefiting the population of lesbian, gay, transgender and bisexual people and their supporters within and beyond central North Carolina. As her goal is to work with LGBTQ children and teens after she graduates in 2018, Lora feels that volunteering at the Center helps her professionally as well, particularly as it applies to helping build multicultural competency. She has had the opportunity to work with leadership and has participated in seemingly every aspect of the Center’s work, including serving on the safety planning committee after the Pulse Night Club shooting in Orlando. While Ms. Taylor has seen the impact Lora has had on the Center, in the year that she’s known her, she has also seen how the Center has benefitted Lora. She explained that Lora had moved to the Raleigh area without knowing anyone and that the Center has helped her make social connections and has given her an outlet for her creativity. Lora doesn’t seem to slow down and can take credit for helping to plan events and programs, helping visitors, working in the library and, ensuring that more multicultural LGBTQ literature was available in the library after a community member voiced concern that people of color were not clearly represented in the collection. The Center boasts the largest LGBTQ literature collection in the Southeast. Even with all that she does, Lora, who was named April 2016 Volunteer of the Month and was considered for the Volunteer of the Year title, has plans to make her life even more productive. Pictured above left: Lora Pilcher. Pictured above right, from l to r: Center Director James Miller, Lora Pilcher and Kelly Taylor.